Once-in-a-lifetime memories are made at Fattoria di Montemaggio! We take pride in producing the best organic Tuscan wines along with a variety of organic products for our visitors. It is our mission to offer you, our guests, the best possible tasting and degustation experiences. We want to create unforgettable experiences for you. As part of our behind-the-scenes tour, we show you our secular vineyards where we cultivate classic Italian grapes including Sangiovese, Merlot, Pugnitello, Ciliegiolo, and Malvasia Nera. On the tour, you will get a glimpse of the most beautiful places here in the Chianti Classico countryside, while you at the same time can taste our excellent wines paired with Tuscan dishes and local organic products produced on-site at Montemaggio by our team of dedicated craftsmen and growers. We offer a selection of exclusive wines including red wines favorites (Chianti Classico di Montemaggio, Chianti Classico Riserva di Montemaggio, Chianti Classico Gran Selezione di Montemaggio, Torre di Montemaggio IGT, Ilaia di Montemaggio IGT e Quinta Essentia Montemaggio IGT), a rose wine (Rosé di Montemaggio IGT), and a white wine (Chardonnay di Montemaggio IGT). Moreover, you will taste our Extra Virgin Olive Oil and Grappa di Montemaggio. This activity takes guests for a walk in the vineyards and gardens (both vegetable and other), cellar, and tasting room all the while explaining the details of organic agriculture. Guests will truly learn the details of growing grapevines organically and making and tasting wine. The tasting will include a sampling of all our products, a mini “degustation” course with various delicious snacks, followed by a blind tasting in black customized glasses. Guests will taste and compare new and old vintages, taste corked or oxidized wine, and learn the difference by sharpening their sense of smell and taste. Often our perception is guided by what we see. When sight is eliminated, we realize the world turns upside down in a way we never comprehended. This is a fun experience that will challenge your wine perception and add something new to your wine world, whether you are a complete novice or experienced wine connoisseur! Our most popular wine tour offering! This tour option features a visit to the vineyards with a guided walk-through of the working process and of organic agriculture, walk through the gardens of the villa and visit of the vegetable garden. Further on, we do the visit of the cellar with explanation of winemaking process and than the tasting of 8 of our own products (Chianti Classico Montemaggio, Chianti Classico Riserva di Montemaggio, Igt Torre di Montemaggio, IGT Quinta Essentia, IGT Rosé di Montemaggio, IGT Chardonnay di Montemaggio, Cuveé Brut Cielo di Montemaggio and Grappa). In addition accompanying the tasting, we offer a selection of different local cheeses and cured meats with bread and olive oil of our production. The entire tour will also include a mini-tasting course to learn how to properly open, serve and taste wines like a pro! Visit of the vineyards with an explanation of the working process and of organic agriculture, walk through the cellar and than tasting of five products (choice of two products among three fresh wines: IGT Rosé di MontemaggioIGTgt Chardonnay di Montemaggio, Cuveé Brut Cielo di Montemaggio, than three red wines Chianti Classico Montemaggio, Chianti Classico Riserva di Montemaggio, Igt Torre di Montemaggio Super Tuscan). The tasting will be accompanied by the selection of local cheeses or cured meats with bread and olive oil of our own production. This is an opportunity to be able to taste most of our products and have an idea about how we follow organic agriculture and make our authentic wine! View of the estate from the roof of the cellar, small visit to the vineyard and a short explanation of the organic agriculture followed by the tasting of 3 products: choice of two products among three fresh wines: IGT Rosé di Montemaggio, IGT Chardonnay di Montemaggio, Cuveé Brut Cielo di Montemaggio, than a red wine Chianti Classico di Montemaggio. The tour includes the tasting of the olive oil of our own production. 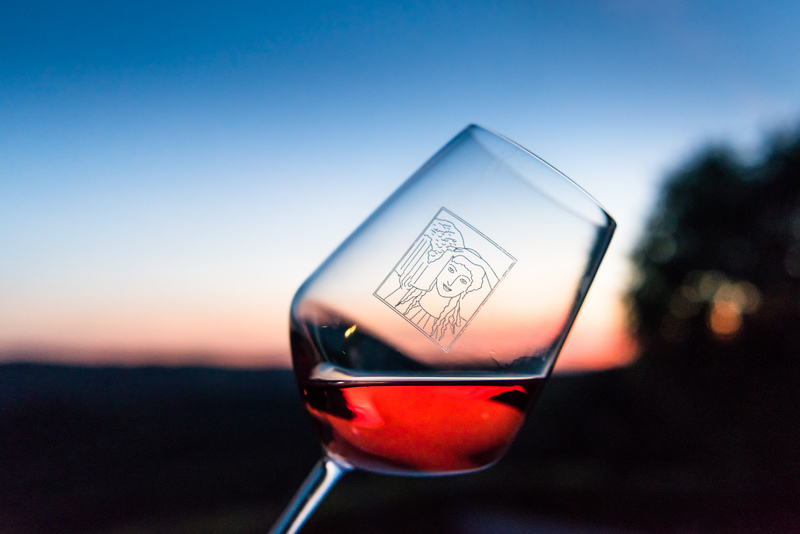 This tour would still give you a possibility to visit Fattoria di Montemaggio and sample some of our products but at a much faster pace if you do not have so much time available! For more info or if you have specific needs or preferences, please do not hesitate to contact us by filling the following form below. To book a visit, follow to the booking page. During your visit to Montemaggio, Valeria, Ilaria, Edoardo or Francesco will show you the estate – the vineyards, the cellar, the gardens and vegetable garden and explain where and how we produce our 100% authentic organic Italian wines. It will be an extraordinary sensorial experience that will reveal why Chianti is one of the most renowned regions for the production of Italian wine in Italy and worldwide and how we preserve the authentic characteristics and quality of the land of Chianti Classico and transfer them to our wines. Montemaggio’s permaculture – furthermore, during the visit, you can admire the garden and the vegetable garden that has been designed by Francesca Benza, an agronomist, and landscape architect. The garden is organized in raised sections where we grow vegetables, flowers, and fruit trees. The fence is protected by trees, plum, apple and pear trees that we decided to use to make an experimental sweet wine mixed with fruit. This tour takes you through the spectacular hills of Radda in Chianti to places not accessible on your own. Your driver will share historical facts, cultural peculiarities, and discuss traditions of the area. Loving to sing, these often come out in song! Upon returning to the estate, enjoy a simple vineyard tour or any of the other activities we offer to make your Montemaggio visit one you’ll remember. To be able to offer you the best service and experience, please contact us to book a visit or fill out the form below. Book a visit or a tasting experience with us! Montemaggio is open from Monday to Friday (weekends and holidays are only by appointment), all year round. The usual opening hours are from 9 am to 5 pm.